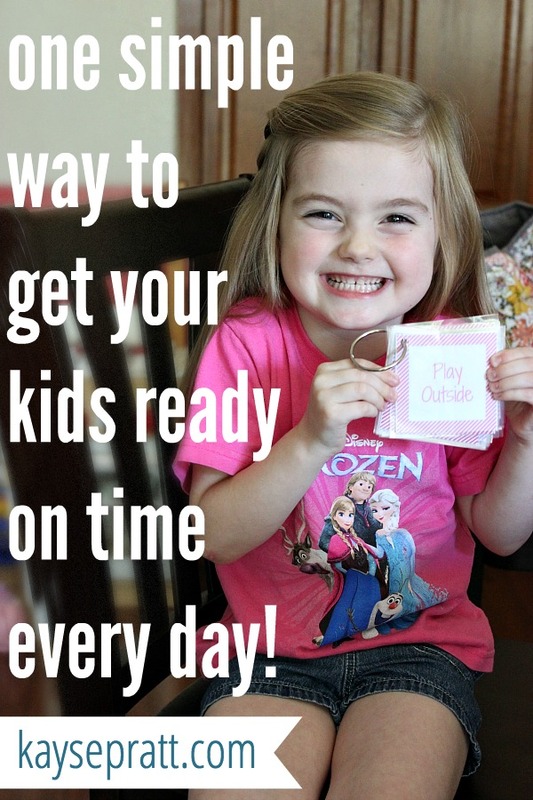 How To Get Your Kids Ready On Time Every Day! Sometimes I joke that the reason I homeschool Emily is because I have no idea how we would get up, fed, dressed, and out the door on time for school every morning. Sometimes that’s not a joke. We have struggled to get our days going, even staying home! With two kids, there’s just a lot to juggle. (You moms with more kids, you’ve got my undying respect.) And those days where we had to be somewhere, like gymnastics or our mom’s group? Well, forget it. We were always late. 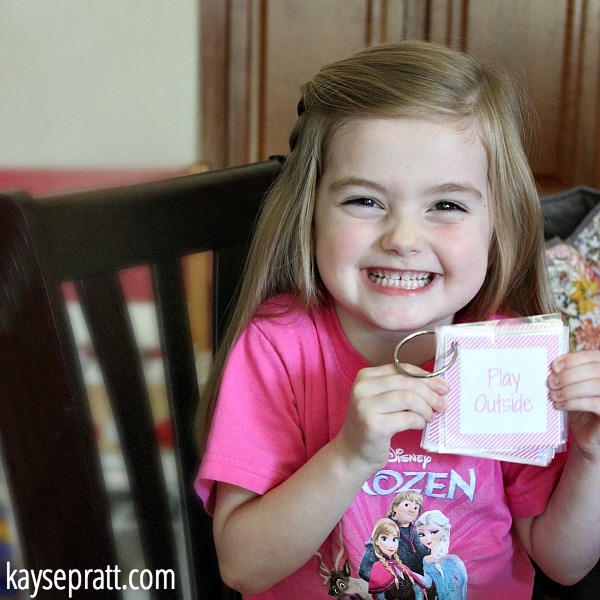 I had such a hard time getting Emily to get herself dressed and ready, and out the door! The same happened at bedtime. We do the same thing every night, but I still found myself repeating my instructions over and over, each task taking forever. The fact is that Emily is old enough to be doing these things on her own, without me micromanaging every spare second. I needed a solution that would keep her moving towards the goal of getting ready to leave the house, or doing her schoolwork, or getting ready for bed, all on her own. In my own life, I love having my daily schedule written out on my planner each day. And I realized that when I was a classroom teacher, I always had the daily schedule posted as well. So, I thought we’d try a daily schedule for Emmy, too! I wrote out everything that Emily needs to do each day in order on a stack of cards. I laminated them and put them on a ring, so that Emily could carry them with her and simply flip to the next task! I wrote out our morning & evening routines, along with our homeschool tasks and chores. Get your kids to do the next thing – no yelling required! Grab these free daily routine cards for kids to help guide them through the day without any arguments. Subscribe here and get immediate access to these printable cards for kids! Woohoo! You’re in! Now check your email to confirm your subscription & download these daily routine cards for kids! On homeschooling days, we use all the cards. On days when we have somewhere to be, we just use the morning routine cards, ditch the homeschooling ones, and pick back up to the right spot in the day when we get home. After dinner, we pick up our cards and follow our evening routine to get ready for bed. I wasn’t sure if Emily would take to these cards or not, but she LOVES them!! She’s able to be independent (which she loves), and feel like she’s checking off tasks (which she also loves). In fact, since the cards are laminated, she can actually write on them with our favorite dry erase markers, so sometimes she really will check them off! Seriously, she loves them. As if you couldn’t tell. Honestly, I love them too. Our days aren’t perfect, by any means, but letting Emily follow the cards takes so much pressure off our relationship. I’m not constantly harping on her to do the next thing – she already knows what to do and she’s excited to do it because she’s doing it on her own! It’s a win-win for both of us! I figured you guys might like these cards too, so I’ve got them all ready for you as a printable set! Just print them out on cardstock, laminate them if you want, and pop them on a ring! You can either use all the cards in the set, or just pick and choose the ones you want to use, like the morning and evening routines! Whether you’re trying to get kids out the door, inspire them to do their schoolwork, or encourage them to GET THYSELF TO BED, I hope you find these as wonderful as we do!! 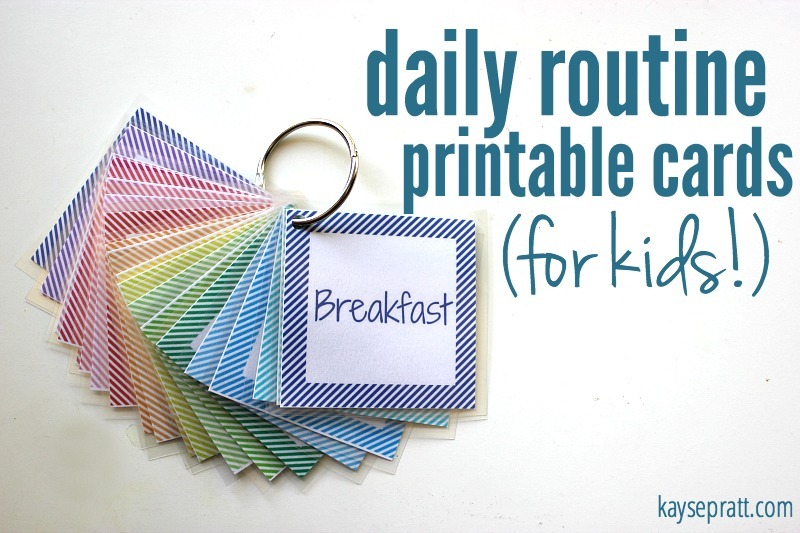 GRAB YOUR PRINTABLE DAILY ROUTINE CARDS FOR KIDS BELOW! Get your kids to do the next thing - no yelling required! Woohoo! You're in! Now check your email to confirm your subscription & download these daily routine cards for kids! Thank you, what a great idea! Do you have any blank cards so I can add some of our own such as practice piano, etc? Hi Tara! They should come with a page of blank ones for you to fill in your own as well! I love your posts and I am definitely trying these cards! Thanks! 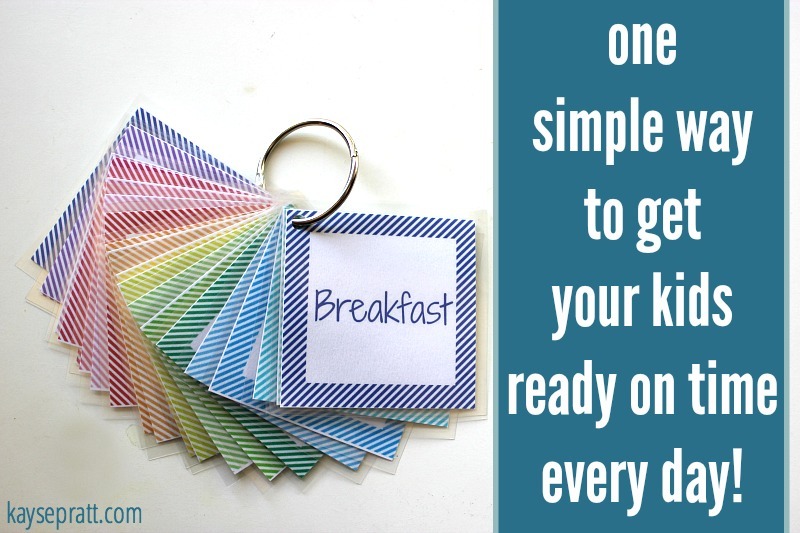 Love this post….I will try to some schedule cards for my kids. Oh my goodness!! She is a little you! Sooo cute. These are great! I was just making some schedule cards for my kids yesterday! I have to use images because they are 2 and 4 and they don’t read yet. I love the idea of putting them on a ring! Wow…..this is amazing. Thank you so much for sharing this because I have been looking for a perfect schedule for some days but couldn’t get. Now at last I found this. This will be really very helpful. Thank you so much for creating these! I’ve been searching for a solution for awhile and this fits our family well! We have 4 now (ages 7, 5, 3, and 1, with another one coming Jan 2017!) This will get the older ones going and I’m certain the 3 year old will follow suit soon! Thanks so much for this! My youngest would especially have fun with it. My girls enjoy having lists and schedules-it motivates me too!